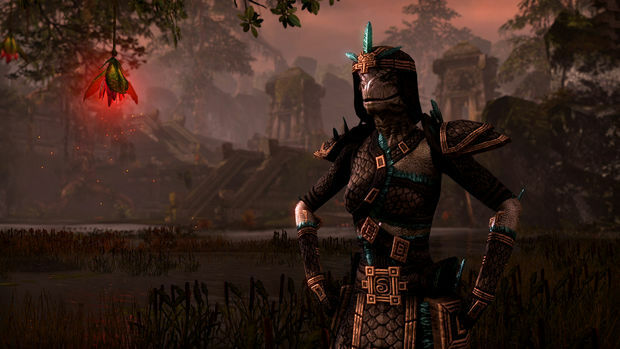 The Elder Scrolls Online has a lot to prove. Not only does developer Zenimax have to placate the fans of old, and sell them on the idea of a subscription based MMO, but they also have to bring in fans who have never played the franchise if they want to sustain their model. As both an Elder Scrolls fan since Daggerfall and an avid MMO player, I was excited to get my hands on the game last week to see what it really had to offer, and if it would deliver on either front. 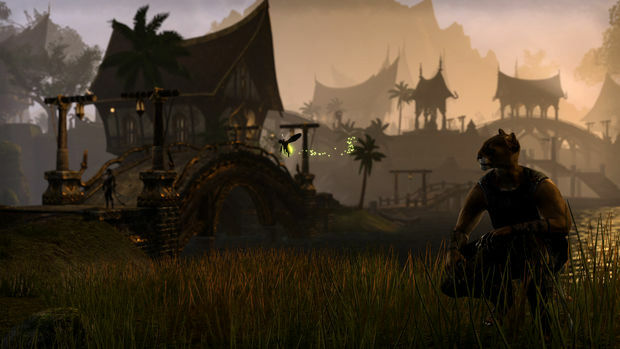 After an extended period play time, I think that in some ways, The Elder Scrolls Online functions as a traditional MMO that won't sway people who have disdain for the genre. But in other ways, it's doing a lot of things that may warrant a second look, and it's looking really good for Elder Scrolls and MMO fans alike. This is how the game will work. After booting up Elder Scrolls Online for the first time, you'll have the option to select from the Daggerfall Covenant, Aldmeri Dominion, and the Ebonheart Pact factions. Each faction will have different playable races -- Breton, Redguard and Orcs for Daggerfall -- High Elves, Wood Elves, and Khajit for the Aldermi Dominion -- and Dark Elves, Nords, and Argonians for Ebonheart. All quests will take place within your respective region, with the option to initiate cross-region PvP. Bethesda revealed last week that after completing your region, you'll have the option to visit the other two with the same character. Of course, you could always create an alternate character and start in a new region as well. 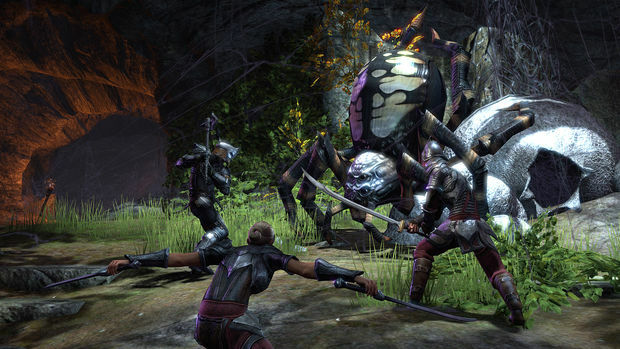 It's odd to segment content like that, but Zenimax claims that each region will contain around 120-150 hours of content each, not including dungeons or PvP. For the purposes of the preview, we were able to play a Daggerfall Covenant character up to level six, so I created a Dragonknight Orc. It's a tank mage class, so I naturally gravitated toward it. There are only four classes in total (Dragonknight, Templar, Sorcerer and Nightblade), but Zenimax notes that they want to de-emphasize classes entirely. Like any Elder Scrolls game, it's mostly just a guide to start with -- you can progress past your template and create your own custom character. There are racial skill trees, guild skill trees, and even a teased vampire tree that Zenimax was almost hesitant to reveal. Abilities can be morphed as they progress through their trees, and if you equip a certain ability class, you'll earn more XP towards new ones than normal. Think of how most MMOs force you to commit to one tree -- this system allows you to at least have some freedom as it gives you a smaller amount even if you're not using it, which is neat. Although our group started in the first major area of the game, there is an instanced story based tutorial to help you learn the ropes. The Elder Scrolls Online is set roughly 1000 years before the events of most of the games. Your character is killed by the forces of Molag Bal, an ancient god on par with the ones you've encountered before on the plane of Oblivion. You wake up in Molag Bal's Oblivion, Coldharbour, and the game starts there. Similar to Guild Wars 2, you'll have a personal story spending the rest of game getting your soul back from the forces of the Daedra. 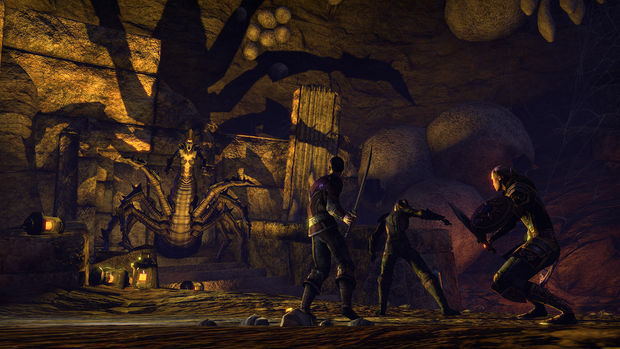 Zenimax tried to convey that the game is mostly a solo experience, stating that, "you are the hero" with the "option" to work with a "band of heroes" to save Tamriel. Essentially, they want you to treat it like a multiplayer Elder Scrolls game, which people have been clamoring for a while. So how's the gameplay? Well, it's a mix of the combat systems found in Elder Scrolls IV and V, and old school MMO thought. 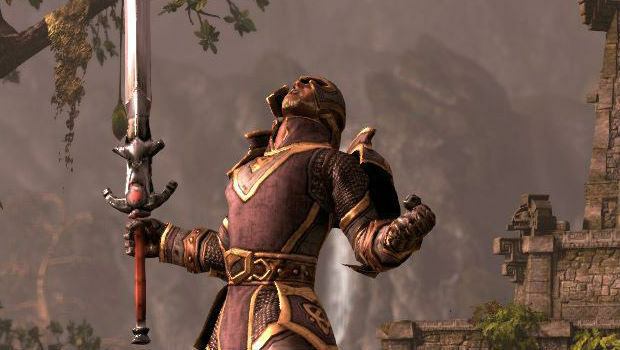 In many ways, Zenimax has kept a lot of the original Elder Scrolls spirit intact. You'll hold down the attack button (defaulted to left mouse) to initiate a heavy attack, and click repeatedly for a regular attack. The right mouse button enables defensive options like your shield or weapon parrying, and left clicking while blocking springs a charge move that can interrupt spells. Double tapping movement keys to dodge is also a nice touch, as I used it multiple times to avoid AOE attacks. In the first thirty minutes or so before I gained any skills, combat felt a little boring, and I had a "this is it?" style reaction. But once I gained projectile based skills, defensive abilities and more, combat ramped up a bit and became more dynamic, like the Elder Scrolls franchise is known for. 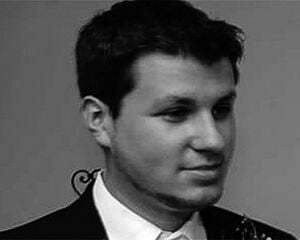 Zenimax confirmed that the game wouldn't ship with native controller support, but it "shouldn't be too hard" to get the game mapped out with third party software, like XPadder or Joy2Key. Spells are bound to your selection of hotkeys like a typical MMO, and work just like Skyrim in real time. You can sneak around like the classic Bethesda games, sprint, and upon leveling up, you're able to choose between a health, magica or stamina upgrade. The locales look true to form for the series. As lead developer Matt Firor stated, there are going to be some fundamental differences compared to, say, Skyrim, but in the world of Elder Scrolls Online, "when you're in Windhelmd you feel like you're in Windhelm." There is a "choice" system, and it isn't really hamfisted either, thankfully. Instead of choosing from lazy Fable-esque snooze-inducing quandaries of "this is Good or Bad," Elder Scrolls Online is a bit more subtle, like the original Dragon Age or the Witcher series. For instance, in the time that I played, I had the option to save three potential crew members for a heist, and choose whether or not a few other story characters lived or died along the way. Whether or not I killed those characters off or not influenced my story as early as a few hours in, as the dialog and interactions I had with other NPCs were directly influenced from my choices. From a design standpoint, the HUD was very, very clean, and I enjoyed the subtle design differences compared to most MMOs, like glowing NPCs to denote quest-givers rather than the typical question marks above their heads -- fully voiced quest NPCs also help bring up the presentation. There's Wayshrines just like Guild Wars 2 for fast travel, but you have to pay more than a nominal fee to use them from any spot on the map. Zenimax stated during the presentation that it was their goal to bring two major groups together: MMO and Elder Scrolls players. The way they want to accomplish this is through story immersion, exploration based content, a deep combat system, and choices that matter. Content wise, you'll have your typical world quests as you're roaming about, in addition to hidden Easter eggs, PvP, crafting, dungeons, and guilds (although only the Fighter and Mage guilds are confirmed currently). Both guilds have meta-games, like the ability to destroy spirit anchors and collect necromancy tomes for unique skills. There's also a full crafting system, including specializations for cooking, weapon smith, armor smith, alchemy, and enchanting. The system itself will support a "jack of all trades, master of one" mentality, allowing you to choose one major skill. Crafters will create some of the best items in the game -- not just consumables or throwaway items. 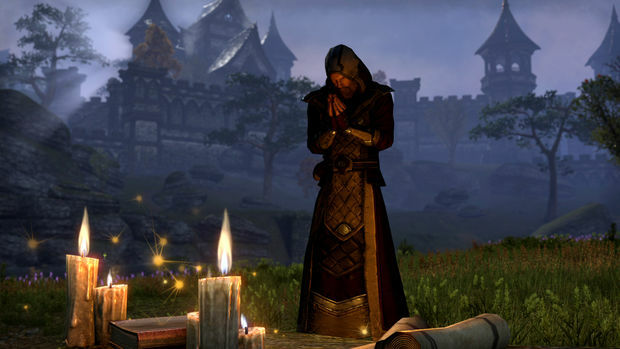 Zenimax stated that they want crafting to be fun and not a grind -- brought about through experimentation, rather than making the same thing over and over to grind skill points. As an example, they showed off the cooking system, which consists of adding two ingredients, and then up to three additives. You can add more or less ingredients to increase potency of consumables, or change the effect entirely. It's a pretty neat and open system that should allow a hefty amount of experimentation. In addition to our hands-on, Zenimax provided a live group dungeon run, showing off the four person party system in the spider themed Spindleclutch dungeon. The main mechanic they wanted to show off was the emphasis on synergy from not only players, but different enemies as well. For instance, a Foot Solider may drop some oil, and call for a Fire Mage to "light it up" for an area of effect attack. Also, Necromancers could perform a ritual at any time to summon a giant spirit monster, sacrificing themselves in the process. The developers claim that these dynamic combat situations could happen at random, which forces you to think on the fly, and makes combat a little more exciting. A distinction was made with enemy groups in that every pull will not be a traditional "tank pulls group" so much as a dynamic experience. The blocking mechanic and other crowd control based abilities helps other players fit into scheme, and get into the action more. After asking the developers directly about how far they were willing to go with this, they noted that they will not be eliminating the trinity like Guild Wars 2 did; only focusing fights towards a less traditional view and increasing the options of non-tanks. What I really liked about the instance is the promise that each dungeon contains a story. In fact, the first time you run it, there's always a deep narrative involved with the dungeon itself. In this particular dungeon, quest NPCs were setting fire to webs as the team progressed through. Like typical MMO instances, mini-bosses (dungeon bosses) were peppered in before the big finale. Although we didn't get to play it, Zenimax also showed off a live PvP test for the first time, showcasing the siege style gameplay of the Cyrodiil zone. Siege weapons were out in full display, destroying keep walls to take out different perimeters to access the keep in multiple ways. Battering rams can also help break down the front door as players try to raid a keep. Tiny arrow icons above enemy heads identify rivals easily, which was a nice touch that most large scale MMO battles lack. As you take structures along the way, you can travel from keep to keep with waypoints. Zenimax said that they don't use development tools or trainers to test PvP because they want to replicate the player experience. Like World v. World in Guild Wars 2, PvP matches will accommodate a few hundred players. Add in their support for endgame content at launch, and it could be a pretty enticing package. As the developers at Zenimax were showing off the game, you could tell that they really cared about the history of the Elder Scrolls franchise. It was clear after playing it for an extended period of time that there will be lots of lore here to uncover; perhaps more than any other Elder Scrolls game before it. Coupled with the confirmed first-person mode, a lot of TES fans should feel right at home with Online -- the only major problem is the fact that they haven't really demonstrated quite enough to justify the subscription fee for more than a few months. But from what I can tell so far, it would be an amazing few months indeed. For those of you who want to see the game for yourself, the beta will start later this month, and it will be playable at PAX East -- which will be the first ever public test of the game.